Don’t let your kids miss this exciting and educational summer camp experience. Contact Warren County REMC for application details. Warren County REMC will sponsor students at the annual Touchstone Energy Camp. The camp will be held June 5-8, 2019, at Camp Tecumseh in Brookston, Indiana. Students entering seventh grade in 2019 are eligible to attend and are selected by their local cooperative to participate in the three-day program. The students’ agenda combines traditional outdoor camp activities with environmental education, electrical safety practices and cooperative business education. “This is a great way for students to learn about the role of the electric cooperative in their community. On top of that, they get to experience all the fun of camp,” said Amy Moore of Warren County REMC. 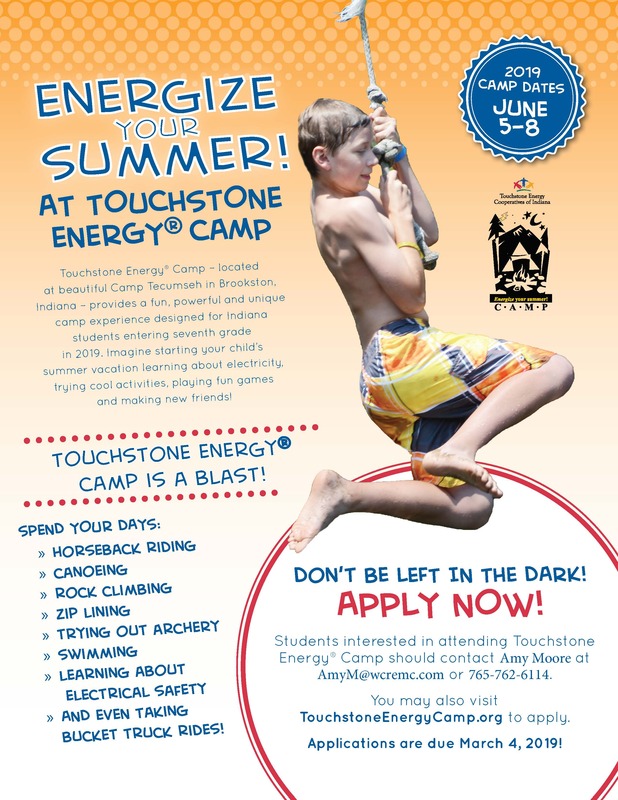 Apply online for Touchstone Energy Camp by visiting TouchstoneEnergyCamp.org or by contacting Amy Moore at Warren County REMC, 765-762-6114 or AmyM@wcremc.com. Applications are due March 4, 2019. The Touchstone Energy Camp program was developed by a committee of electric cooperative employees from Indiana. The camp is funded in part by Indiana’s electric cooperatives, Hoosier Energy, Wabash Valley Power, Indiana Electric Cooperatives and other industry partners. To apply online click here for TouchtoneEnergyCamp.org. Warren County REMC, located in Williamsport, Ind., is an electric utility cooperative serving over 3,700 members in Benton, Tippecanoe, Vermillion, Warren, & White counties and maintains over 1,000 miles of line. For more information about the cooperative visit wcremc.com.